Previously, many actions were opened in tooltip windows which lay above the existing content. For usability reasons, this has been changed in many places and switched to the embedded tooltips new in Intrexx 8. 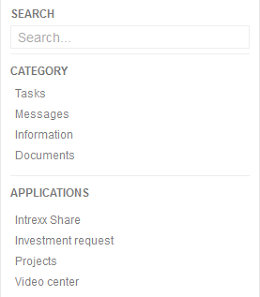 In the Intrexx Share plugin, you can define that content from Share posts, groups, events, photo albums and profiles should be included in the global search. In addition to the content, which belongs to a category, the applications, which are listed beneath the category filters on the News page, are now search through as well. The Navigation bar can now be reset to its original settings if modules have been moved with drag & drop. Your contacts and contact suggestions are now summarized in one container. Posts can now be marked as "Important" or "Urgent". Furthermore, the setting "Important" and/or "Urgent" from the plugin can be overwritten by the user. 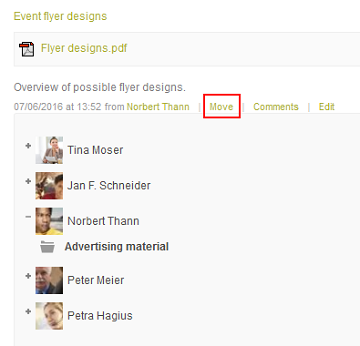 The corresponding filter can be found in the modules News, Groups, Events and Personal page. The entire Filter area in the left-hand column of Intrexx Share 2.1 has been reworked to improve the overview and usability. 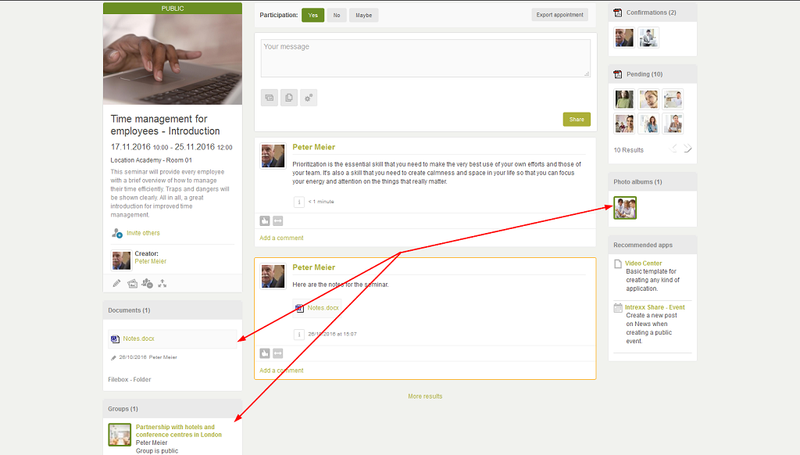 The various pages of the Share plugins have been completely revised and switched from a table layout to a DIV layout. This means that they, to some extent, behave responsively and adjust themselves automatically to the width of Share. 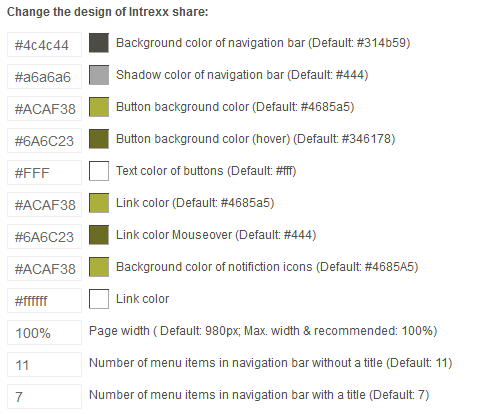 In the Personal settings, the appearance of Intrexx Share 2.1 can be adjusted. The round icon appearance for photos, contacts etc. can now also be selected instead of the standard square icons. Furthermore, the column width for the right and left column can be defined. The actions, such as "Share", "Remind me" etc. have been summarized to save space but if you would like to show them permanently, you can select that option here. The number of comments that should be should can also be defined here. The notifications via email can now be configured in a wide variety of ways. 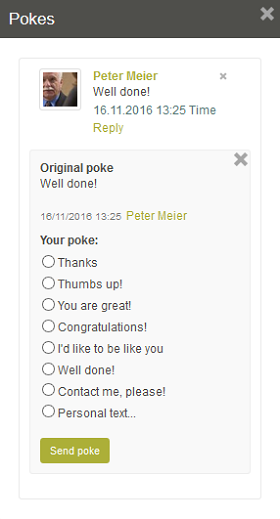 Responding to pokes has been revised and simplified. When creating a post, you can specify that you would like a read confirmation. A corresponding button will be shown in the post which the read can use to provide the confirmation. The creator of the post will be shown the total sum of readers. The visibility of posts ("Everyone", "Contacts", "Private", "User-defined") is shown with a colored border around the image of the creator. When creating a post with the visibility setting "User-defined", Share groups can now be selected as well. This allows you to create a post in multiple posts directly. The appearance of photos and files in posts and comments has been revised. If files or images are uploaded in the file field of the post or comment, these will be differentiated in the view. Text in posts that are too long are now no longer cut off but hidden with a fade-out. Multiple moderators can be defined for groups. The moderators are listed on the overview page in the group information and on the group's details page. The information that is shown for each group by clicking on " Information" on the overview page has been redesigned. For group posts, the status (public, restricted visibility etc.) is depicted with a border around the preview image. Now possible on the News page. The additional information about events has been revamped. Click on "Export appointment" to export the relevant event data as an ics-file that can then be integrated into Outlook or other calendars. Both on the event overview page and for the event posts, the status (public or private) is depicted with a colored border around the event image. In an event, you can activate the setting that a post announcing the event is automatically generated on the News page. The participation buttons "Yes", "No" and "Maybe" are also available in this post. Furthermore, the post can be marked as important and/or urgent when the event is created. In the Intrexx Share Events module, a calendar plugin has been defined for the "Event" data group. This plugin can be added to any calendar of your choice. The appearance of photos and files has been updated. 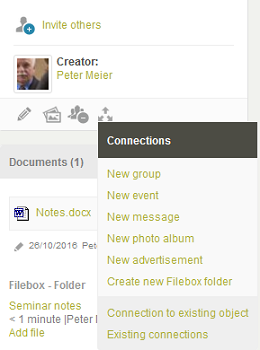 Files can now be moved to other folders directly in Intrexx Share. The "Photos" module has been revised in favor of improved appearance and simpler usability. The multi-file upload is now also available on the edit page for photo albums. The status (public or private) of a photo album is depicted with a colored border around the preview image. Now, if a user clicks on a picture, a page will open where they can make comments and use the "I like this" action. When creating a new album, you can activate an option to automatically create a post on the News page that the album has been created. The gallery view of the album can be opened either from the link in this post or on the album's view page. The creator of the album can sort the photos via drag & drop. The status of an advert ("Public") is depicted with a colored border around the advert image. New or already available data records from the Share modules can be linked to one another or with data records from other applications by clicking on " Connections" (e.g. groups with groups, events with groups, events with photo albums, advertisements with groups, filebox with groups etc.). If you are an Intrexx Share administrator, you have access access to the administration area. Click on the "Show more" button on the right-hand side of the navigation bar and then on "Administration". The settings made here apply to all Intrexx Share users. The Administration mode is now signalized graphically. As well as the colors, page width, width for the left and right columns and the number of menu items in the navigation bar - with and without title - can be defined. In the administration area, deactivated users are now indicated.